Skudo is a beautiful modern theme with eye catching design and super strong framework behind. This All-In-One package includes premium plugins, unlimited customizability, built-in mega menu, full WooCommerce design integration, typographic options with over 800+ Google fonts, robust admin panel with hundreds of options, tons of useful visual page builder elements and ready layouts available with just 1 click! 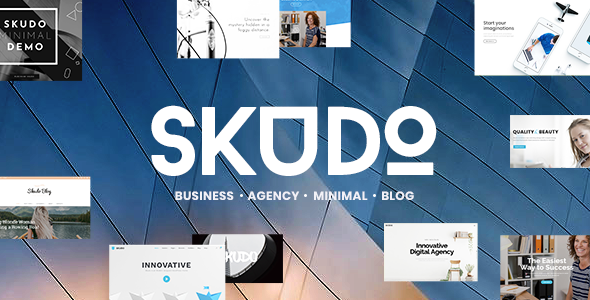 Fully Responsive Skudo looks great on any device, from mobile to desktop and beyond. Super Clean responsive design fits to any screen. Try resize your browser window and see for yourself! Compatible with WPML, BuddyPress 2.5.x, WooCommerce 3.1.x, bbPress 2.5.x, Gravity Forms 1.9.x, Easy Digital Downloads 2.5.x, Events Calendar Pro 3.12.x, Events Calendar, Visual Composer 5.1.x, Bootstrap 3.x. Skudo has been tested with browsers IE9, IE10, IE11, Firefox, Safari, Opera, Chrome, Edge.